Gusto is a robust solution that offers compliance, benefits administration, and payroll features. This application is used by thousands of small businesses in the US to manage their employees’ HR needs. It delivers solid payroll features, an easy-to-use interface, and impressive automation and innovation tools. The vendor’s stated goal is to simplify business processes such as payroll, benefits, and HR for its customers that total more than 40,000 nationwide. Gusto offers worker’s comp insurance, 401(k), and payroll nationwide as well as benefits in select states. You can avail Gusto’s features by paying a base price of $39 per month plus $6 per person. This package includes direct deposit, new hire reporting, unlimited payroll runs, year-end W-2s and 1099s, and more. There is no contract and you can cancel your account any time. The vendor also offers a free trial that you can utilize to check out the software’s features before investing your money. Plus, they offer reliable support over phone, email, and chat. The customer support agents are based in San Francisco and Denver, and are available Monday through Friday, 6am to 6pm Pacific. In our Gusto reviews we detail the benefits, pricing and more about this software. You can use Gusto to set up your payroll to automatically run on a set schedule so that your employees are paid on time. Plus, this feature minimizes the risk of human error as there is no human intervention. Another advantage is your company can go green by making use of paperless transactions as the app delivers digital paystubs by email. Gusto can also automate the calculation, payment, and submission of your firm’s federal, state, and local payroll taxes. Plus, businesses have the option of paying through check or direct deposit. Charitable employees can set up their accounts to donate to their favorite charities straight from their paychecks. Plus, Gusto is a flexible bookkeeping system as integrates seamlessly with popular accounting systems. Save time: You can let Gusto manage your year-end forms, time off calculations, ACA compliance, forms, payroll taxes, and other details, and focus on important work. Reduce errors: It can be an arduous task to enter data into multiple websites and apps. Gusto automatically calculates deductions and stores your business data in one place for easy access. One login for all tasks: One of the benefits we consistently note in our Gusto reviews is that the solution makes it easy to find crucial employee info. You can use one login to access details such as time off balances, birthdays, phone numbers, I-9s, W-2s, and more. Automated payroll: You simply need to select how often your team members need to get paid and the system automatically manages the rest including employee paystubs, W-2s, tax filings, and other details. Simple benefits administration: You can talk to the vendor’s licensed advisors and use the intuitive software to easily manage benefits. Plus, you can have a custom plan tailored for your needs. 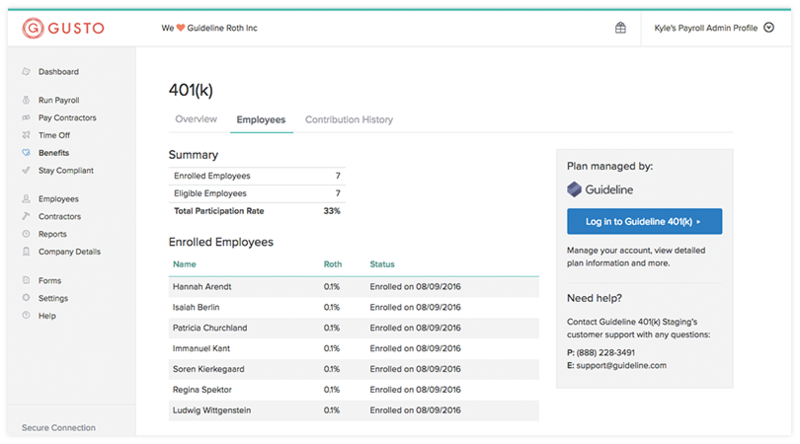 Streamlined HR: Gusto consolidates and stores all your employee info in one place including new hire documents, anniversaries, emergency contacts, and more. Integrated 401(k): You can easily set up and manage 401(k) plans to help your company employees save funds for retirement. You can check out this Gusto review for more information of the software’s capabilities.